Zev Zukerman knows that he's unusual. Two days after the Sept. 11 attacks on his adopted country, the Russian emigre joined his campus ROTC program at the University of California at Berkeley. The 18-year-old likes the statement his uniform makes on the campus, where small but organized student opposition to the war in Afghanistan just makes him mad. 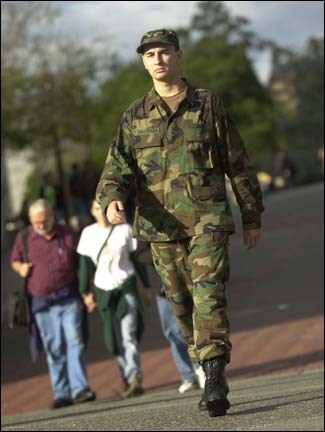 "Nothing feels better than walking through campus with an Army uniform on," Zukerman said. "Nothing makes me more proud." Reserve Officer Training Corps units on campuses across the country report that they, like military recruiters, got a flurry of inquiries about joining their program in the days immediately after the attacks. Unlike Zukerman, most did not follow through - though some ROTC officials predict they will see an increase in enrollment next fall. But at Berkeley and countless other campuses, the sight of a cadet wearing a military uniform is generating open curiosity, questions and even expressions of admiration from students who never noticed them before. Even at Harvard University, which banished its ROTC program from campus during the turbulent protests of the Vietnam War era - and later killed its funding - there is evidence of growing support for a return to university-sponsored officer training. "In the days before Sept. 11, the amount of support and gratitude for men and women in uniform on the campus was lukewarm at best," said Harvard student and Army ROTC battalion commander Charlie Cromwell. "Afterward, I saw a complete change in that many students who never really had a voice on the matter spoke up in support of us." More than 1,000 Harvard alumni are lobbying the administration to restore ROTC as an officially sponsored university program. If successful, the move would not return the training to campus, but would restore funding and access to university facilities. Harvard's ROTC cadets cannot earn college credit for the training they receive at MIT, nor can they set up a booth on campus except on corporate recruiting days. ROTC supporters are encouraged, too, that Harvard's new president, Lawrence Summers, says the university has an obligation to support the war effort. Summers suggested in an interview with the campus newspaper that patriotic support from institutions like Harvard could help heal old wounds left over from the Vietnam War. Harvard cadets began traveling to the nearby Massachusetts Institute of Technology for training when Harvard banished them from campus in 1969. But then Harvard eliminated the off-campus program's funding a decade ago after an openly gay cadet was forced out of the unit. Harvard's ROTC program continues today only because the alumni provide the annual subsidy of $135,000. David Clayman, who graduated from Harvard in 1938, has been lobbying for more than a decade, first to return the program to campus, and now to simply restore ROTC funding and status. From 1988, it took 13 years for Clayman to cultivate a list of about 750 like-minded supporters. The list jumped to more than 1,000 in the weeks after the Sept. 11 attacks. "People are still calling in," Clayman said. "The new president recognizes and has set a pattern of respect for cadets." The ROTC program was established in 1916 to help supply the U.S. military with educated officers. Texas A&M, which began as an all-male military college, still has the largest group of military cadets outside the service academies. About 2,000 men and women are in "the Corps," and all of those take basic ROTC training during their first two years. Harvard, by contrast, has 20 cadets enrolled in the exiled Army ROTC's Paul Revere battalion, which trains about a mile and a half from Harvard. College students in Army and Air Force programs may sign up for two years of ROTC training with no obligation, or can choose the participate in a subsequent two-year program that will end in their commission as an officer. Navy ROTC participants sign up for a four-year training program, and all are obligated to service upon graduation. All branches of ROTC offer scholarships. Participation in ROTC programs dropped off sharply after the Vietnam War and again at the end of the Cold War. For example, there were almost 178,000 Army ROTC cadets enrolled in colleges during the 1966-67 school year. Last year, only about 28,500 were enrolled. "The college kids today don't have a clue what was going on in Vietnam, or on the college campuses during the Vietnam era," said Lt. Col. Jim Wallace, executive officer for the Houston Consortium Naval ROTC detachment. "I was in an ROTC unit during Vietnam - those were some interesting times," Wallace said. "But since that point, in my personal career, I've seen a gradual increase in respect from the civilian community toward the military. Obviously if we're successful in our campaign in Afghanistan, the military will receive some benefits from that." John Sibley Butler, University of Texas ROTC liaison officer, said he thinks there's a lot of overall interest in the military that hasn't shown up yet at the recruiting centers or as increased participation in ROTC. Some ROTC programs are structured in a way that any increase in student participation would not be measurable until the beginning of the next fall semester. "But if I were a betting man, I'd say there will be a lot more interest in the officers corps in September," Butler said. 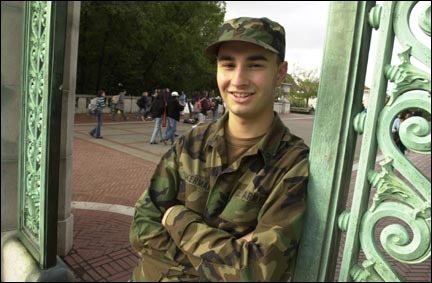 UC-Berkeley has about 170 students enrolled in the Army, Air Force and Navy ROTC programs. Four people came to inquire about Army ROTC in the days following the Sept. 11 attacks, said Army ROTC instructor John Katz, but only Zukerman made the commitment to join. At 18, Zukerman has only heard about the massive protests that rocked the campus during the Vietnam War more than three decades ago. Berkeley students were some of the most aggressive opponents of the Vietnam War. In late November 1966, a large demonstration was organized against a Navy ROTC recruiting table set up in the Student Union building, and eventually led to a student strike against the university. But while Harvard is a private institution, UC-Berkeley is a land-grant college bound by congressional mandate to provide officer training. ROTC stayed under the university's umbrella in spite of the pressure politics of the late '60s and early '70s. There have been pro-America rallies at Berkeley since the war in Afghanistan began. And some protests have been directed against increased surveillance of immigrant students in the wake of the attacks. But Zukerman still bristles at the opposition he hears on campus. "I'm originally from Russia," Zukerman explained. "We came here (in 1989) when I was 5. My dad was in the Russian army." A lot of Berkeley students take for granted the freedoms they've grown up with, Zukerman said. He was furious the night of the attacks, he said, when a vigil on campus began with a focus on the tragedy but evolved into a political discussion. "They were all talking about how the real evil lies in Washington, that it was America's fault," Zukerman said. Two days later, Zukerman joined the ROTC. He said he's unsure about a commitment to military service after college, and concedes that his family is still puzzled by his choice. "I think the benefits in life come when you take the most unusual risks."